Learning how to make a quilt has never been easier. 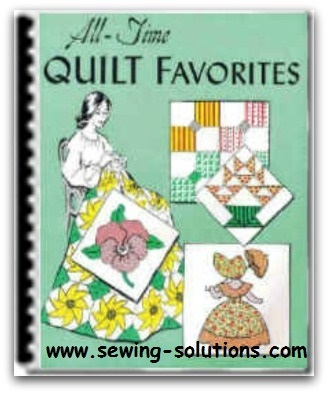 This ebook collection of “ALL Time Quilt Favorites” has been gathered together from many sources . . . quilting friends, quilt collectors, records of quilt and quilt pattern sales and from one of our special sources of inspiration, Louise F. Roote, retired Editor of Capper's Weekly. 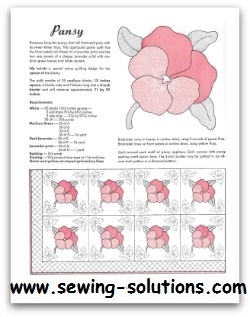 In the twenties and thirties when everyone wanted to learn quilt making was enjoying great popularity, Mrs. Roote, then Home Editor, using her mother's hobby and collection as a base, developed a special quilt pattern feature that proved to be one of the most popular features of the Weekly. There are included some of these favorites and you will note them as you go through the pages. So, quiltmakers, old and experienced, new and eager to learn, we hope this collection will inspire you and that you will find many hours of enjoyment in making your favorite. Art Director - Dorothea Purse!! The first thing to decide when you learn how to make a quilt is, deciding the size of the quilt you wish to make. Our great grandmothers often mode enormous quilts to cover big featherbeds with an overhang at the sides to conceal trundle beds. Many beautiful quilting designs to choose from.also. Patterns in this ebook are for actual size. 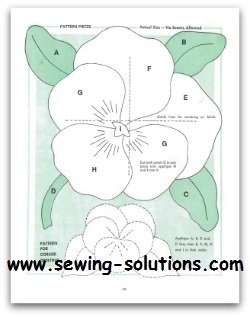 Make a cutting pattern by tracing the pattern pieces onto a tissue or tracing paper. Cut the tracing along the outer edge and lay on top of fine sandpaper or blotting paper. Patterns made of either of these materials will not slip when marking around them on the fabric. For accurate results, it is important to keep all corners sharp. Make more than one pattern so that when one is worn a second may easily be picked up.